Any self-respecting Nintendo fan knows already that several sources have spilled the beans to both Eurogamer and The Wall Street Journal about how the Nintendo NX is expected to work. According to the reports, Nintendo's forthcoming game console is to be a primarily handheld affair in the same vein of its DS and 3DS line of systems. 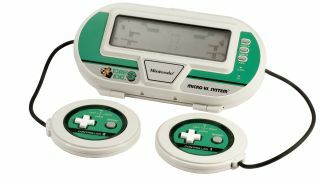 However, the console – complete with its own screen – is expected to allow "local" multiplayer via two ports through which players can connect their own controllers. Yes, the console is supposed to connect to a docking station situated beneath your TV for home play and run on Nvidia's Tegra chip, but that's beside the point right now. What about this controller business? It sounds pretty weird – and frankly, hard to visualize. Well, what if we told you that this wouldn't be an entirely new and alien concept from Nintendo? Digging for gold in the time machine? While discussing the news this morning, TechRadar How To editor Matt Hanson simply posted the above image in the TechRadar office's chat room. What you're looking at is one of Nintendo's Game & Watch Micro Vs. System models. What you see above was a mobile iteration of the Donkey Kong 3 arcade game, but others included Donkey Kong Hockey and the simply-named Boxing. Each clamshell unit contained two dinky, wired controllers inside with nothing more than a directional pad and one action button specific to said game(s). If you're feeling especially nostalgic, you can still find them on Amazon. Even before Nintendo hit its stride in videogames, the company was stressing play with others, and that ethos just oozes from the firm's most recent home consoles, the Wii and Wii U. So, don't be surprised when the Nintendo NX, whatever its final name may be, is revealed later this year to be something of a trip down memory lane. Now, Nintendo struck gold once with this approach in the DS. Whether it can do so again – and boy, does Nintendo need a hit – is yet to be seen much less whether this is even the company's plan. But hey, same-screen multiplayer iPad games sure are a lot of fun, so maybe Nintendo's on to something once again. Now, what about this PS4 Neo?